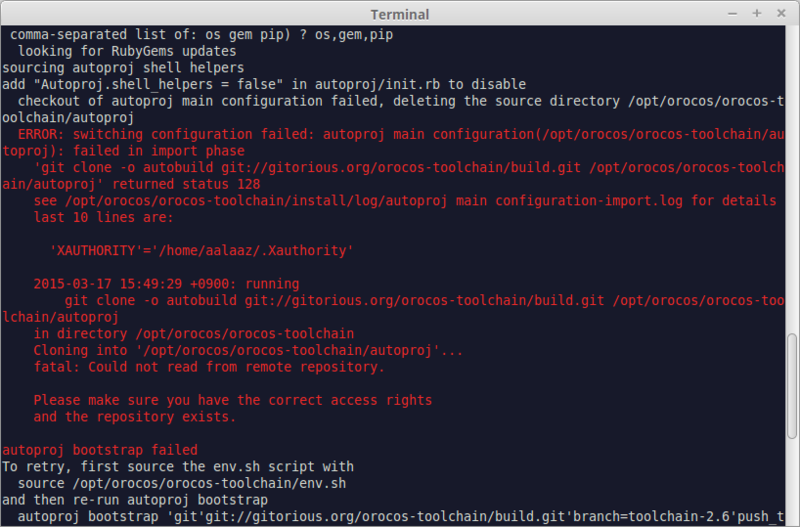 I am trying to install Orocos Toolchain 2.6 on my Linux, which I did before 3 successfully times. But this time I can not. I don't know what is the wrong but it seems there is an issue on the server because I tried to do it using 1. Installation: the easy way (Linux) and 2. Installation: from zip/bz2/gz files, but both are failed. I am even can not clone the files from the server. Please find the attachment file this is one of the error that I get every time using the first method. the second method seems it is not has all the files because it is says for example rtttypelib doesn't exist. Submitted by AbdAlrahman on Tue, 2015-03-17 08:03. I would like to add that the easy way method succeeded after make some changes in the bootstrap.sh to interact with the git server as http protocol, and select http also during the clone and build steps. But still there are some issues which is mentioned before which is related to the service.hpp under rtt component, and the typelib project. Submitted by dries on Tue, 2015-03-17 13:04. Use: make docapi dochtml docpdf to build the documentation. Does anybody now a fix for this problem? > and select http also during the clone and build steps. > the service.hpp under rtt component, and the typelib project. Submitted by Ruben Smits on Tue, 2015-03-17 13:20. Ubuntu distros. You'll need to use toolchain 2.7 or newer. > Use: make docapi dochtml docpdf to build the documentation. > Does anybody now a fix for this problem? > > and select http also during the clone and build steps. > > the service.hpp under rtt component, and the typelib project. Submitted by dries on Tue, 2015-03-17 13:24. > Which Ubuntu version are you using, which boost version do you have. > newer Ubuntu distros. You'll need to use toolchain 2.7 or newer. Submitted by Ruben Smits on Tue, 2015-03-17 13:40. >> Which Ubuntu version are you using, which boost version do you have. >> newer Ubuntu distros. You'll need to use toolchain 2.7 or newer. >> Use: make docapi dochtml docpdf to build the documentation. >> Does anybody now a fix for this problem? >> > and select http also during the clone and build steps. >> > the service.hpp under rtt component, and the typelib project.